Up to now, studies of urbanization in India have been based only on official urban figures as provided by the Census Surveys. This approach has inevitably introduced several avoidable biases into the picture, distortions further compounded by numerous regional inter-Census adjustments. A much sounder option is now available in the Geopolis approach [www.e-geopolis.eu], which follows the United Nations system of classifying as urban all physical agglomerates, no matter where, with at least 10,000 inhabitants. 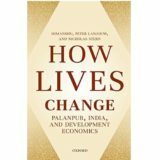 Looked at from this standpoint, the Indian scenario exhibits all signs that, far from a major demographic polarization led by mega-cities (as is commonly believed), what the country has been experiencing is a much-diffused process of urbanization. While 3,279 units were officially categorized as urban, the Geopolis criterion has identified 6,467 units–about twice as many–with at least 10,000 inhabitants. Again, in the matter of the rate of urbanization, the Geopolis yardstick places the figure at 37% for 2001, 10 points of percentage above the official estimate. In absolute terms, that difference accounts for 100 million inhabitants. Apart from this fact, brought to light by both physical identification and gradation of the census units of all localities, and a study of the morphological profiles of individual agglomerates, a major finding relates to the greater spread of the country’s metro and secondary cities than had been believed up to now. Yet another revelation thrown up by this study is that statistical and political considerations have obscured the emergence of small agglomerations of between 10,000 and 20,000 inhabitants. This omission can only be seen as a gap in the national policy on planning and urban development. In other words, the country seems to be firmly headed toward an extended process of metropolitanization alongside diffused combinations of localized socio-economic opportunities, clusters, cottage industries, and market towns partially interlinked by developmental corridors.